‘Reflection’, an artist’s preferred word to the more commonly used ‘Procrastination’…and yes, I do ALOT of both. asking for help to title my latest painting. I had been referring to it with the working title of ‘Reflecting’, but was procrastinating, pondering and reflecting ripping my hair out, as to whether this was the best title or whether is was a little, lets say, on the uncreative side of life. I had an amazing response from quite a few literary genius’ on FB…my biggest response to a FB post in a very, very long time (thanks to Fb’s tact of only showing my posts to a handful of people at a time.) Anyway…moving right along…thanks for nothing FB…I got so confused by this incredible display of word talent, that I have decided to keep it simple and not move far from the original title of ‘Reflecting’, with a simple change to ‘Reflection’, which rolls off the tongue a little easier. ‘Reflection’ tells the two stories that are painted onto this canvas. 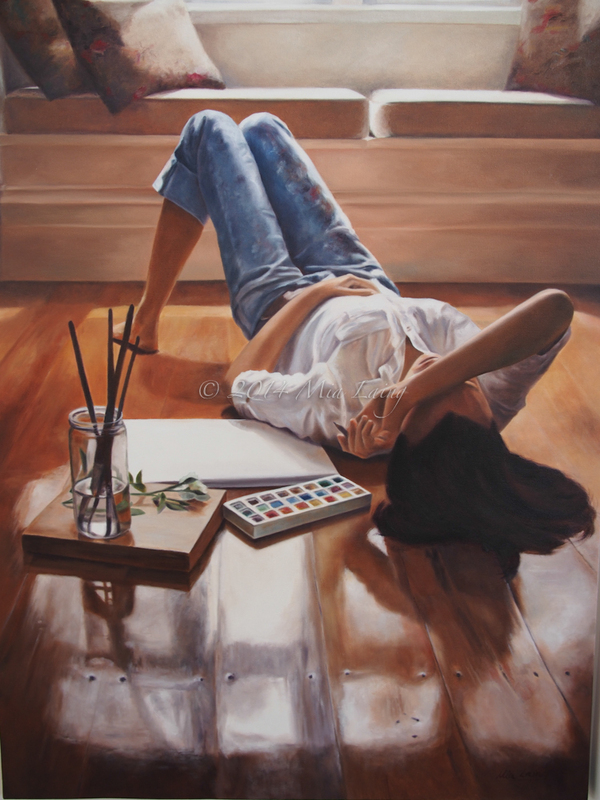 The warmth and light reflecting off the floorboards and the window seat and of course, the reflection of the artist, thoughts running wild, pencil in hand, pondering, contemplating, awaiting inspiration, soaking in the sunlight of an autumn’s day. I am totally thrilled with the outcome of this painting. The colours, the mood, the composition. I had planned it…planned, as in, knew that I wanted a painting of an artist in paint splattered jeans about to start a new art piece. I didn’t quite know how I wanted the composition to be until I noticed the sunlight tinting the floorboards in our sitting room with an amazing array of hues. A day prior to taking the reference photo for this painting, we had a garage sale and a trip to the tip to get rid of an assortment of junk from around the house. I persuaded my husband to (finally) shift out two old couches that our chaotically destructive kitty cats had been using as a scratching posts for the last ten years. Low and behold…the light that fills a room laid bare of furniture. Luckily for me, I had an amicable model needing a break from her Year 12 studies, who happens to fits my clothes (better than me I might add, but we won’t go there just now) and who also happens to be rather talented with a paintbrush. She grabbed that set of watercolours and pad of paper before I could even adjust my camera settings. I played photographer. Bel painted. I gasped at delight how our 110 year old jarrah floorboards, artistically showed off their scratches and scars of time; Bel relaxed into the zone of warmth thrown by the bay window and lost herself in that moment of time, away from the stress of physics revision and mathematics. What do you think? Painting joy, in so many ways. Thanks so much if you helped with title suggestions…I think a few of you suggested ‘Reflection’…see I do listen… a little bit! On other news…I am about to embark on a rather large commission….C.O.M.M.I.S.S.I.O.N. 4 kiddos, 2 fur kids. That’s 6 beloveds in one painting. Wowsers. Photo Shoot done…it was tricky, but the reference photo has been chosen and its a beauty! I’m super excited to get started, awaiting canvas, prepping my colour palette, oiling the squeaks out of my easel and joints. It’s a hush, hush commission so its going to be a little quiet on Fb and instagram for a while before the big unveil.